Well, today was the first really really big day. The crew was at the house at 7am to shoot it. 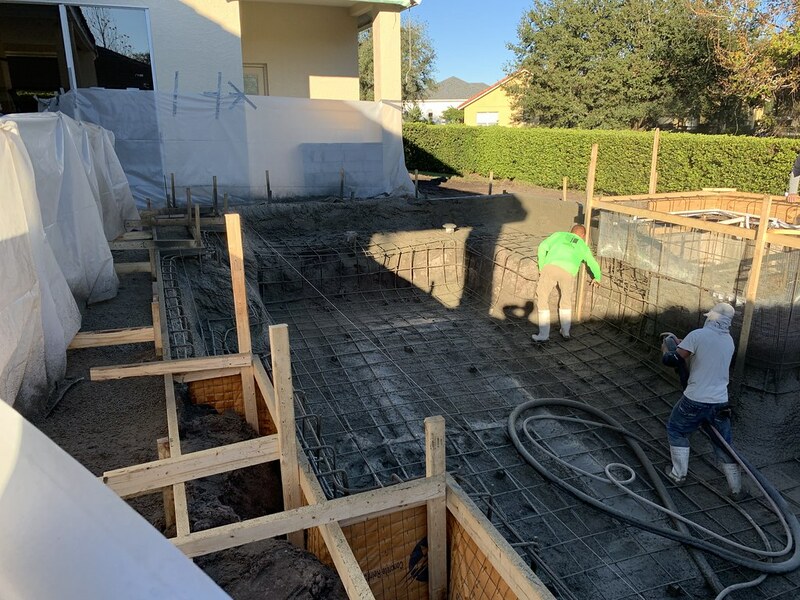 4 trucks and 36 yards of shotcrete were used. They started shooting just before 0730 and ended after dark around 6pm. We finished the spa using a bunch of cell phone lights. Unfortunately, it was dark, so i dont have many pics of the finished product, but the crew was absolutely phenomenal. 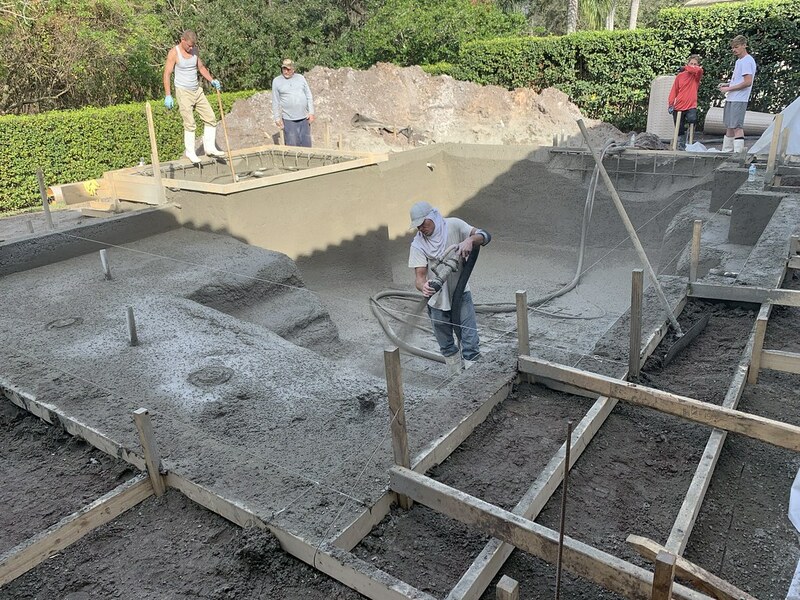 They made a shotcrete pool look like gunite. They edged all the steps and benches. Everything was level and square. They were absolutely meticulous and they were not your typical rough construction felons. Slipped them a dead president at the end of the day to go out for dinner. It was 4 guys who worked their butts off and I could not be more impressed with their attention to detail. I will upload more pictures tomorrow when the sun comes up. 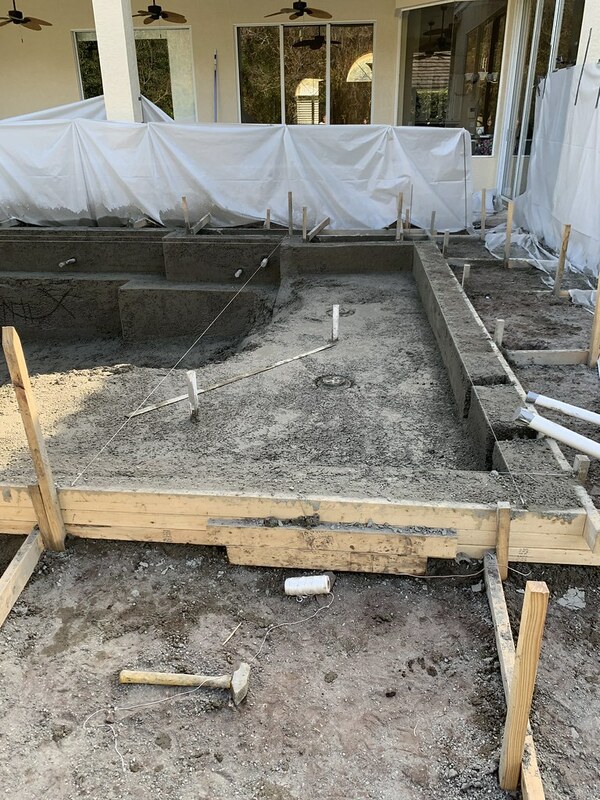 The best part of today, we budgeted 10k for concrete and came in several thousand under budget which will offset the cost of the footer for the deck. We actually ended up missing a huge mistake in the steel phase. 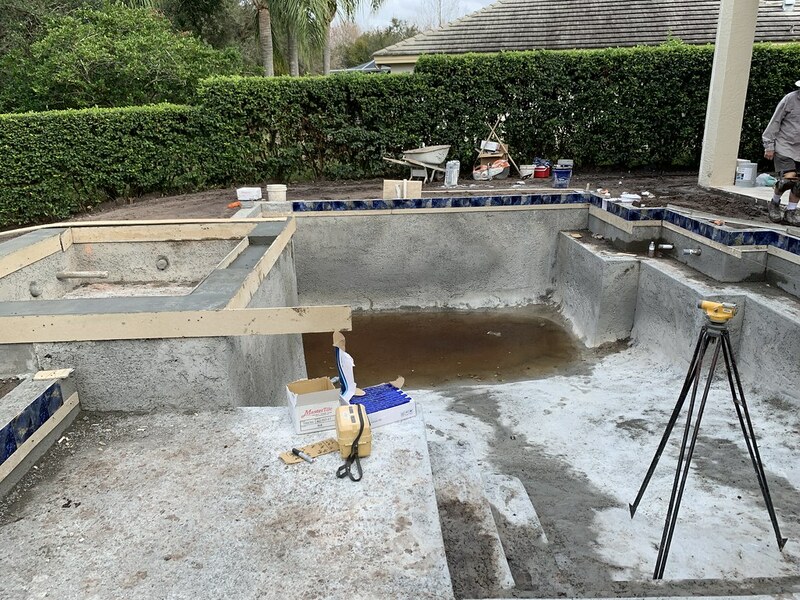 The bench on the house-side of the pool was supposed to stop 5 feet from the end of the deep end, but it ended up running the entire length of the pool. We ended up liking it since it acts as more of a swim out in the deep end, so we went with it and are fine with it. 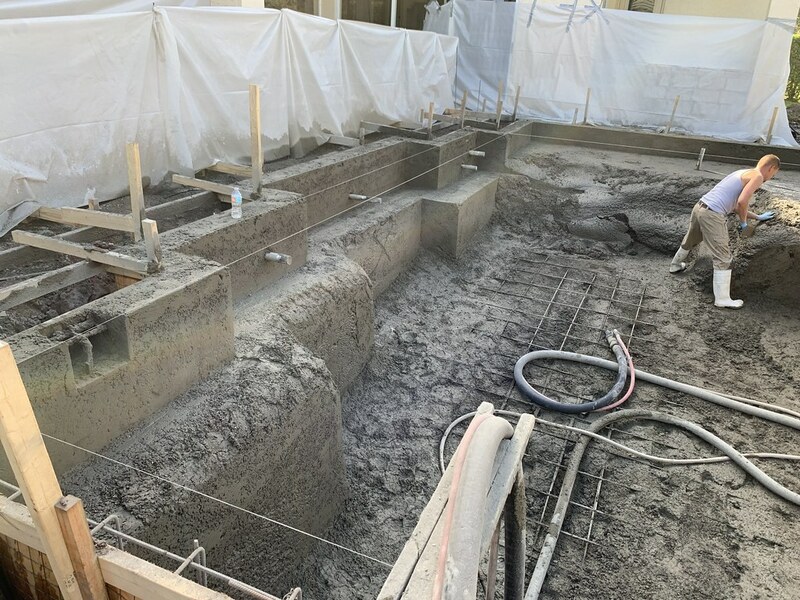 All of the returns were placed by the shotcrete crew as well as lights. We are doing Pentair Microbrites. They are about 10 inches below the water line, which is still above the bench, so my concern was that there would be a shadow cast below them due to the bench. 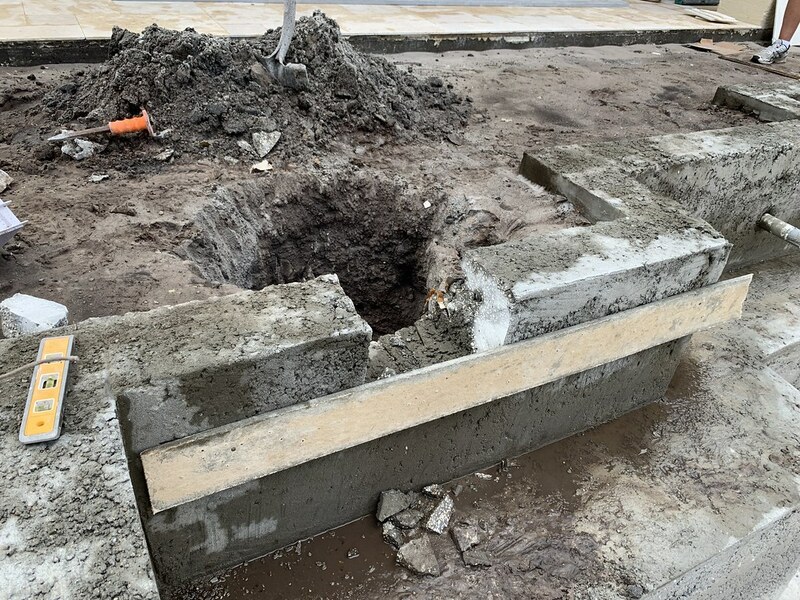 The reason we chose to keep them up a little higher was we did not plan how much 1.5" pipe we would need and did not have enough to account for an 18" wide bench plus the 8" beam to pass the pipe through with extra length on each side. If anyone is thinking about running a bench on the same side of the pool that the lights will be on, keep this in mind. I have a feeling a black line will be cast due to shadowing but ill keep my fingers crossed. The littlest crew lead also spent the last few hours outside with me tearing it up. We must have done 20 laps around the back yard. Up and down... up and down... up and down... up and down.... repeat x 24538204. 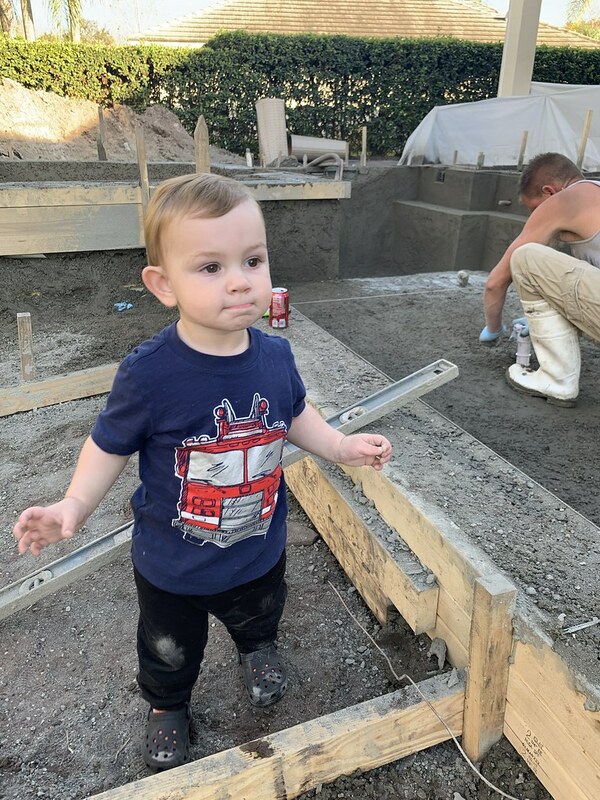 He was not thrilled that he could not play in his new pool yet. That is what I call a "happy accident"! I like it and think it will be well used. It also it will be a safety feature for your littlest crew member. If he gets tired while swimming in the deep end he will have that bench to get to and hold on to!!! Man they did do a good job! You can see the attention to the details! 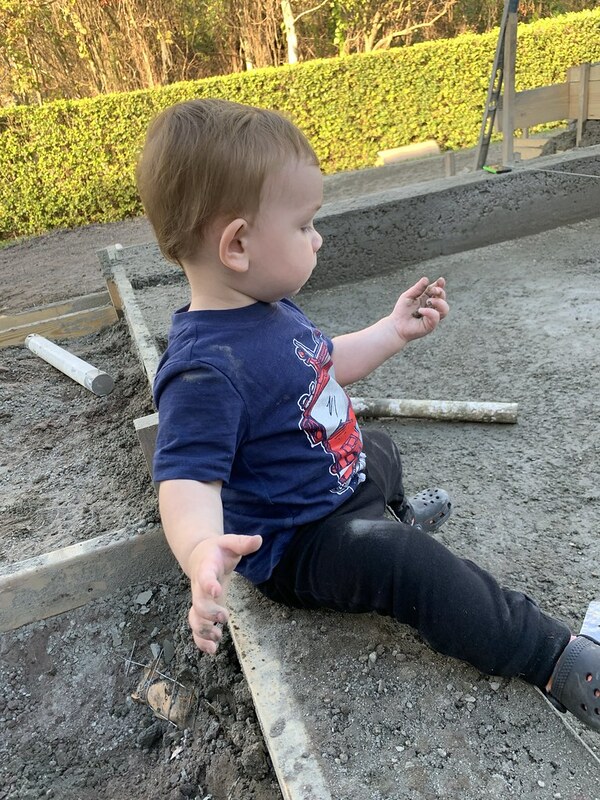 Looks like the littlest crew member had a blast! SO CUTE! Have you started bonding with the pool? aka watering it. This will help slow the curing down. Some small cracks may still happen but so long as they are no bigger than the edge of a nickel you are fine. How current are your regents in your test kit? Might want to see about updating them if they are over a year old. I recognize your inspiration photo. We live in Starkey Ranch. Looks great! Who is your PB? Wakerider, we are doing an owner builder. The pool was on Barbour trail, it was one of the M/I model homes. I have subs that i can recommend if you wish to try an owner builder. So far it is going quite well. 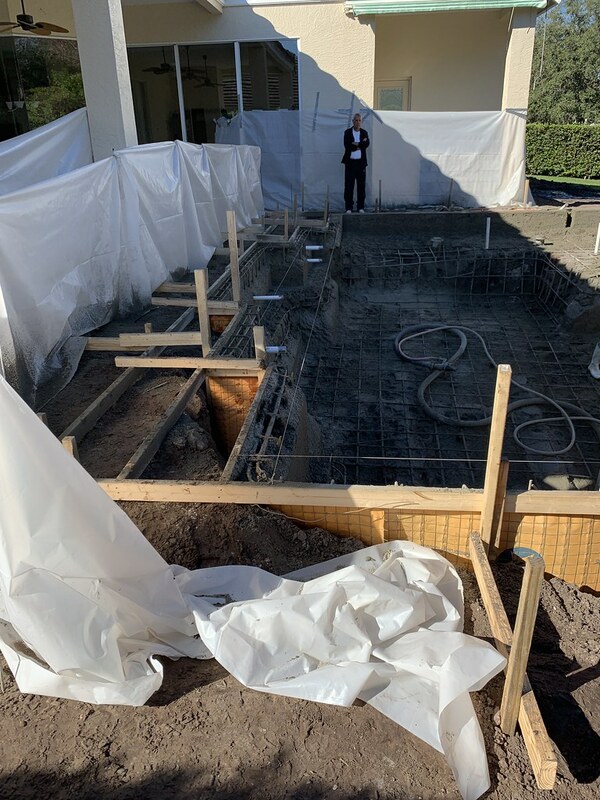 The way the scheduling is looking, we will be done with water by the end of February, but we will see. Kim, yes, i have been out there watering it. Thankfully, the day after the shell was done it rained, so i didnt have to do anything. My test kit does not exist yet, i have not ordered the TF100 yet but i will be soon. 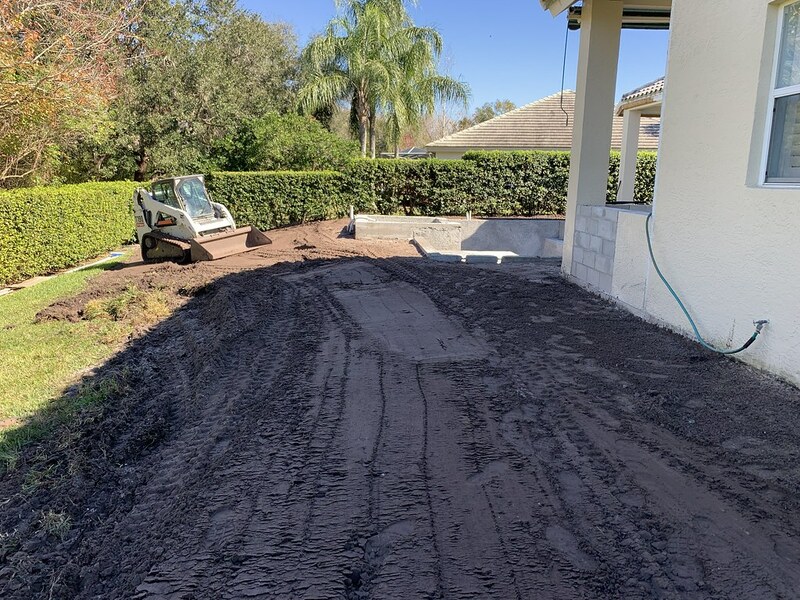 Today, we had a grading done of the back yard and property. 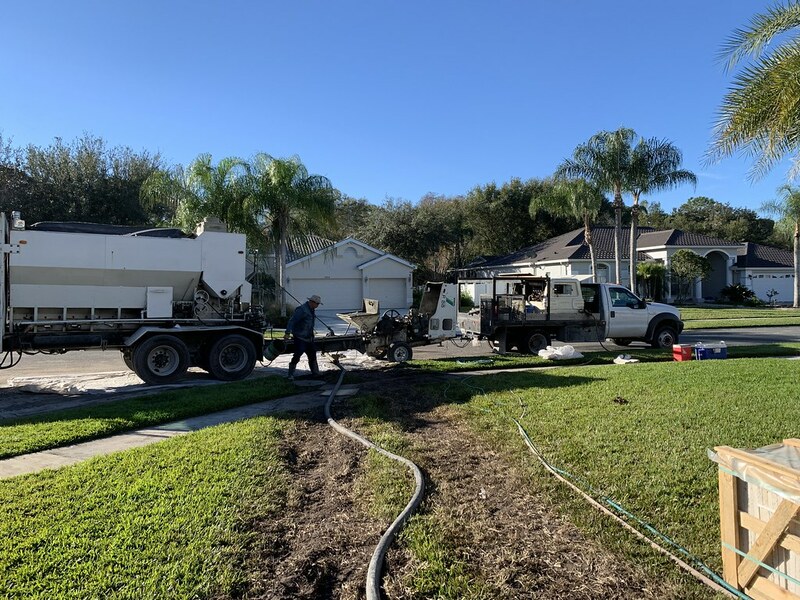 Plumbing and electric will take place together early next week. Both subs requested that they be on the job together so that they can dig together and do everything together. 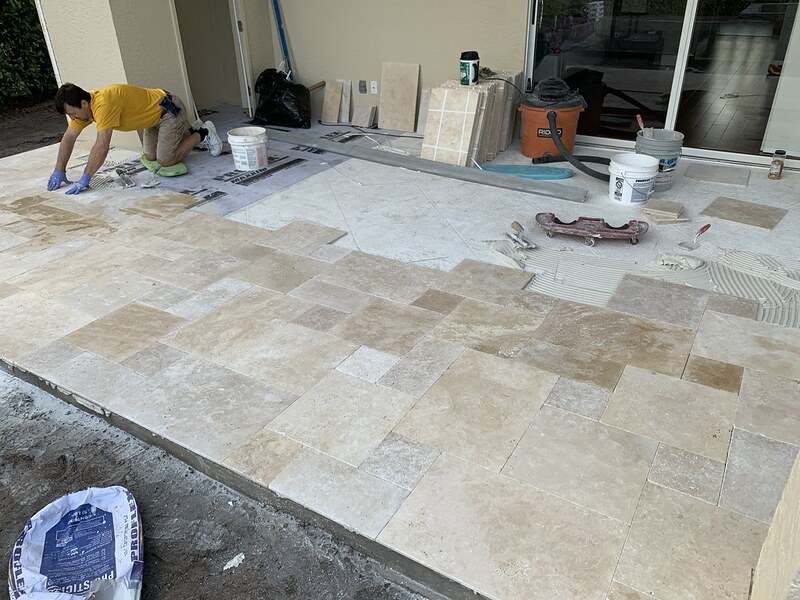 The travertine tile installation will be installed on the covered patios starting Wednesday and should be finished by Friday. We ended up finding one spot in the shell where water was wheeping through, but it was minimal and we were told not to worry about it as the plaster will seal it. We are well above the water table on the property. Smart move on the subs to work together!!! Might even save you a little money in the process! 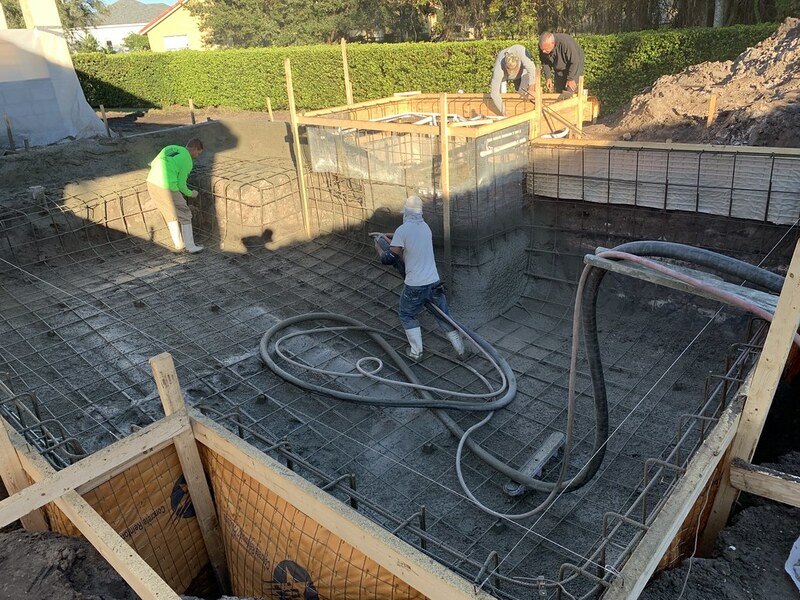 Any issue with the rebar going through the skimmer and being cut out vs them bending (horseshoe) and continuing underneath? 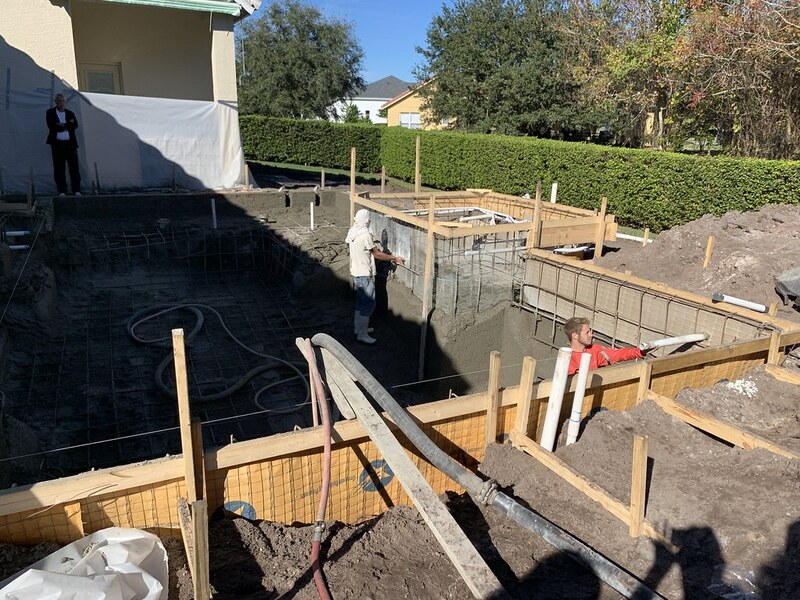 So long as there is room for the skimmer and plenty of shotcrete covering the rebar it is all good. 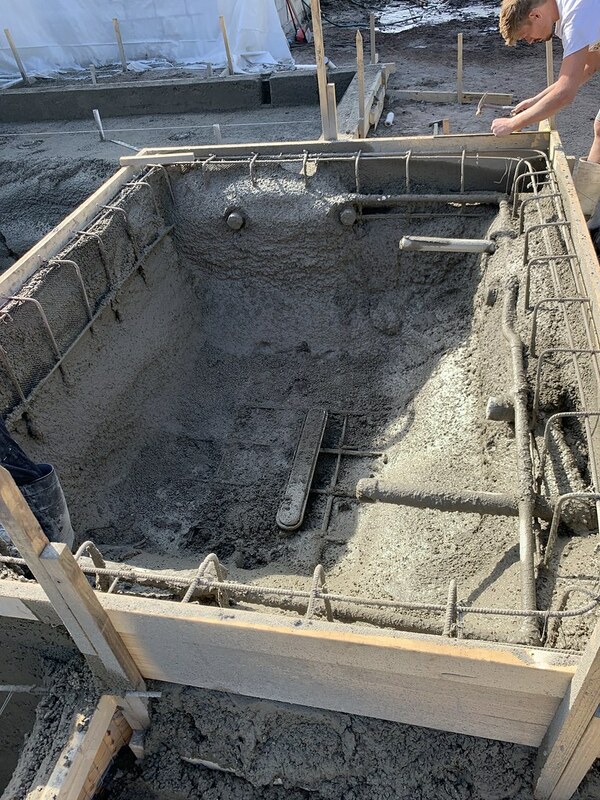 You do NOT want the rebar sticking out of the shotcrete at all! Kim, I think that's the issue in the picture above. In the middle left of the photo you'll see an opening for the skimmer, but there is rebar running through it. Looks like it will need to be cut out? Wondering if that is a problem? Sorry about that. The pic did not show up the first time I opened this post. That COULD be a problem Let me call one of the guys I trust who will know IF it is really a problem and what to do if it is. It doesn't even look like the skimmer is installed???? There is a generic but very specific detail for skimmer that needs to be done. Skimmers are a very common place for shell failures/leaks so you need to make sure this is done correctly. Take notice of #1, 3 and 5 particularly. Can you post your pool engineering? The skimmer is not currently installed. I am not home so i dont have the engineering plans in my phone. 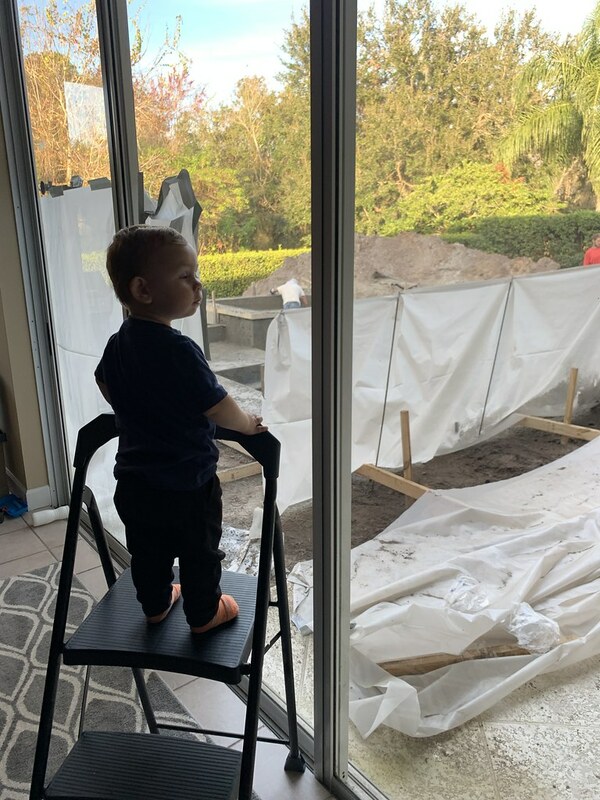 When we were planning, the guy who installs the tile said that he wants to set the skimmer after the fact. 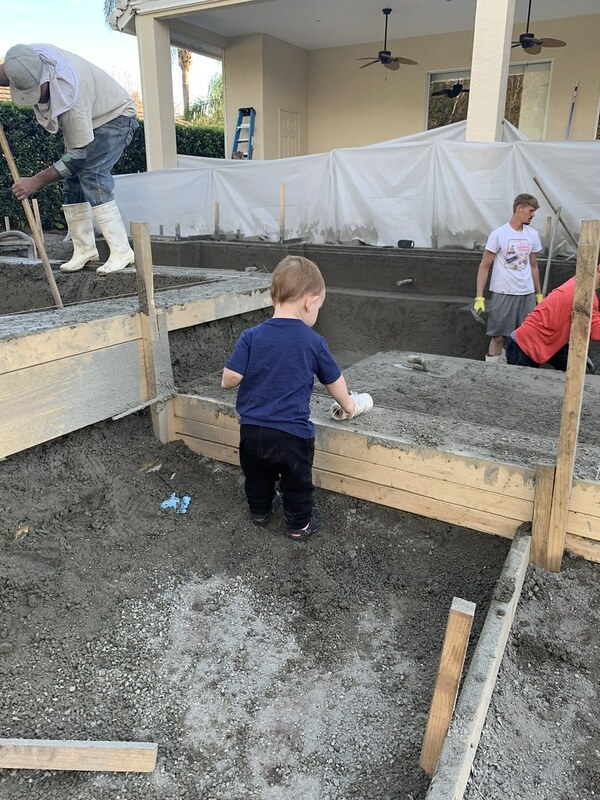 Im not sure why but he begged us not to let the shotcrete crew do it. 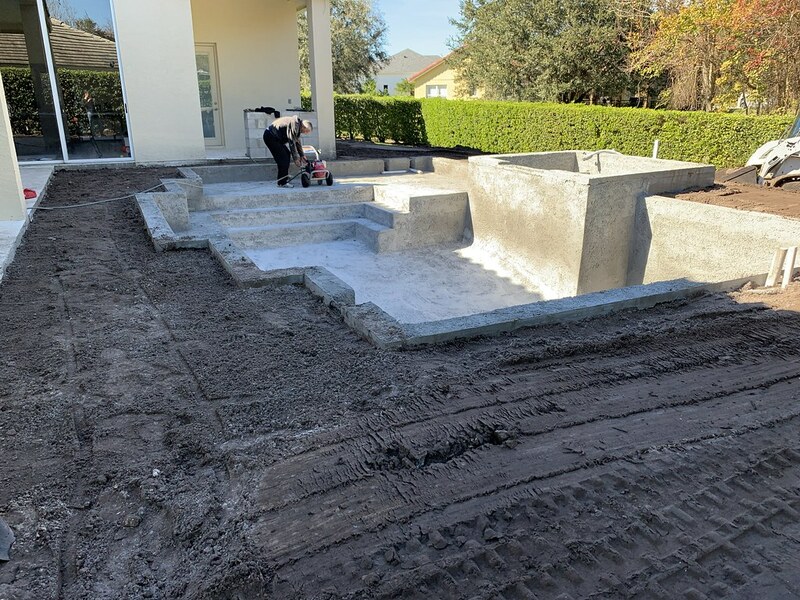 When they were shooting the pool, they said it is common to install the skimmer after the fact as long as its either secured in some sort of hydraulic cement or something. I dont really have a much better answer than this. We picked up all of the plumbing supplies today. Spent $1100. Almost fell over. But the guy at the warehouse said we bought all the high end stuff where as the builders buy the cheap stuff. All schedule 40pvc, all rebuildable valves, etc. We tried getting bell end pipe but they did not sell it, so couplings it was. Never seen it done that way. 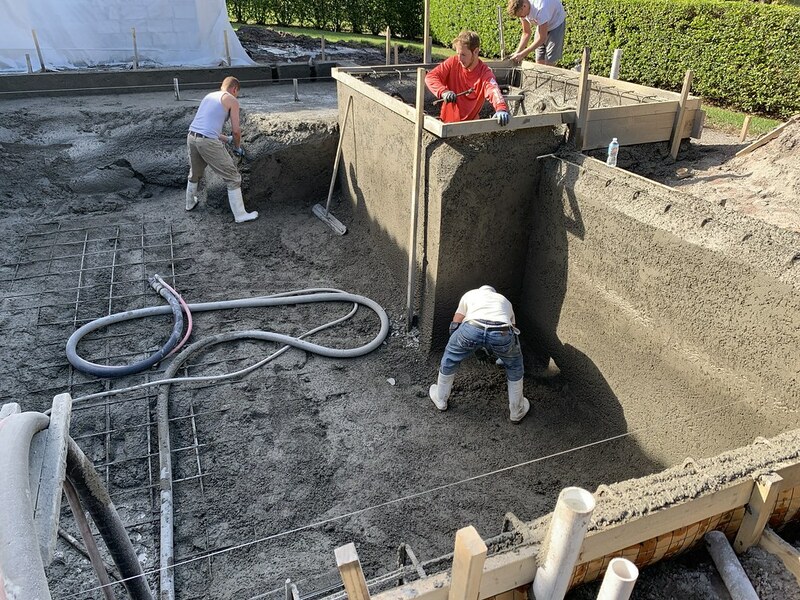 I would want the skimmer encased in shotcrete and rebar so the entire assembly is monolithic. Well, today we made a little more progress. We finally decided on pool tile. 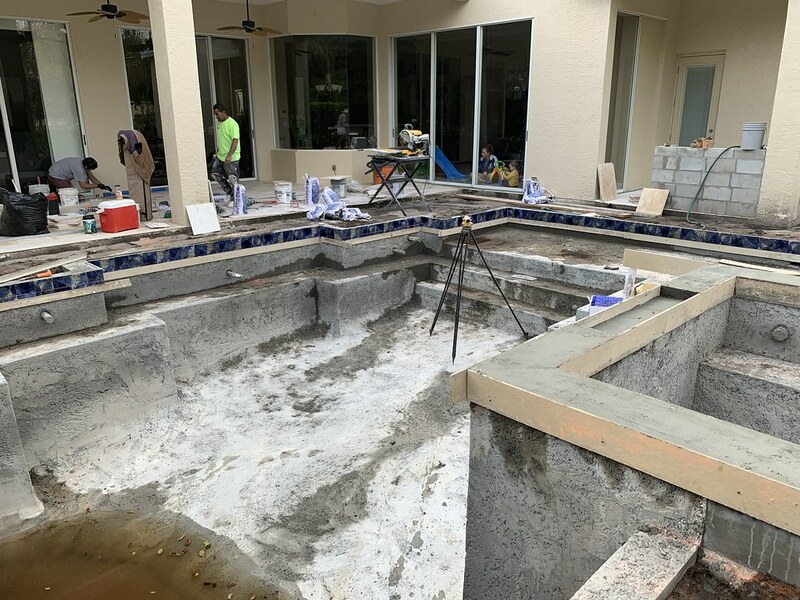 We pulled one out of Poolbella's playbook and did a 1x2 blue glass tile on the spa and then a 6x6 porcelain tile for the waterline in the pool. The spa itself took almost 50 sq feet of glass tile. 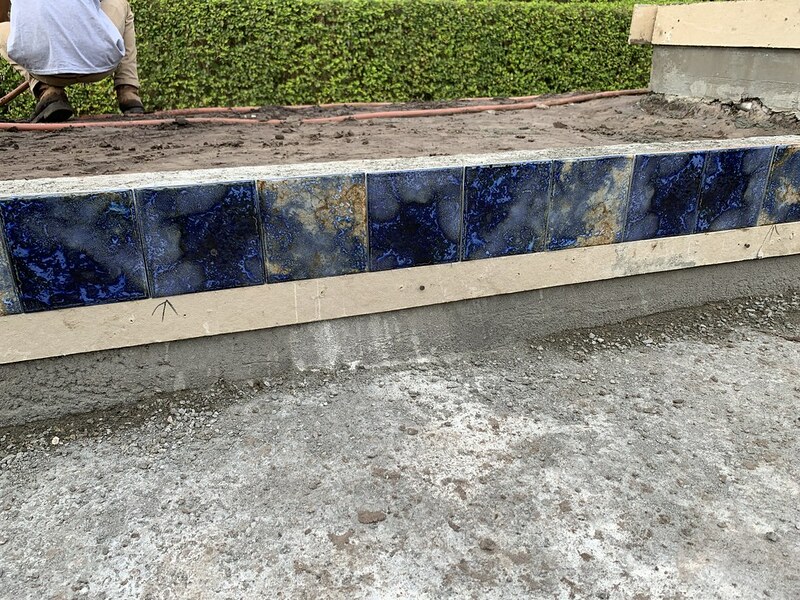 The step and bench markers will be 2 rows of the glass as well. It was $11.49 a square foot. Ugh. 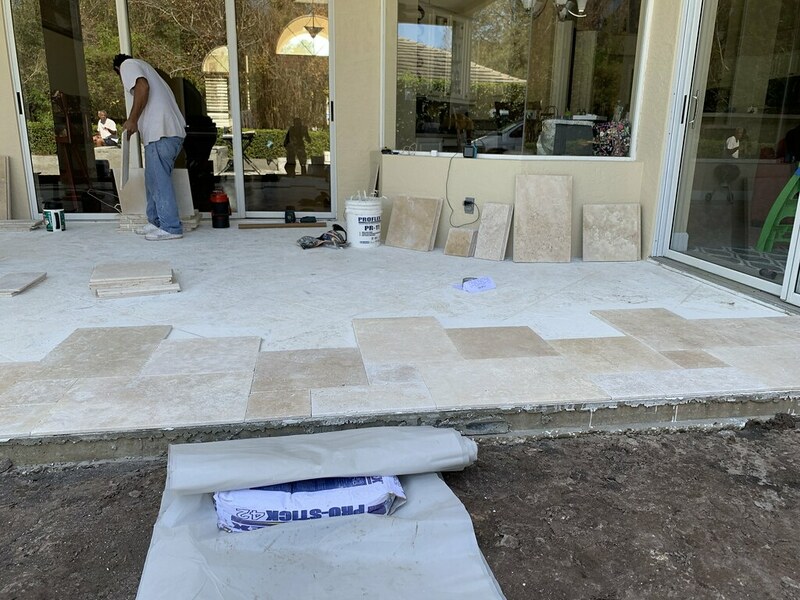 Our tile guy came today to put the travertine tile on the covered patio deck. 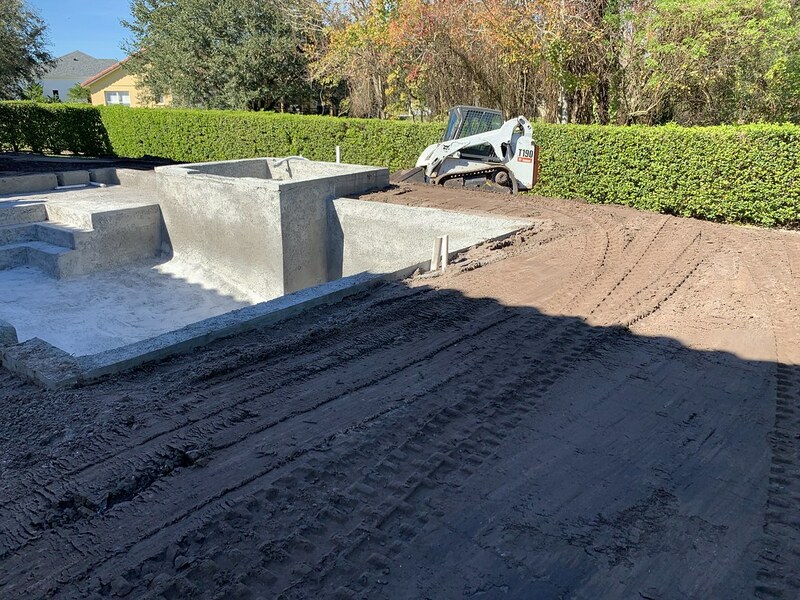 The entire surface was grinded first so that the thinset can adhere better. 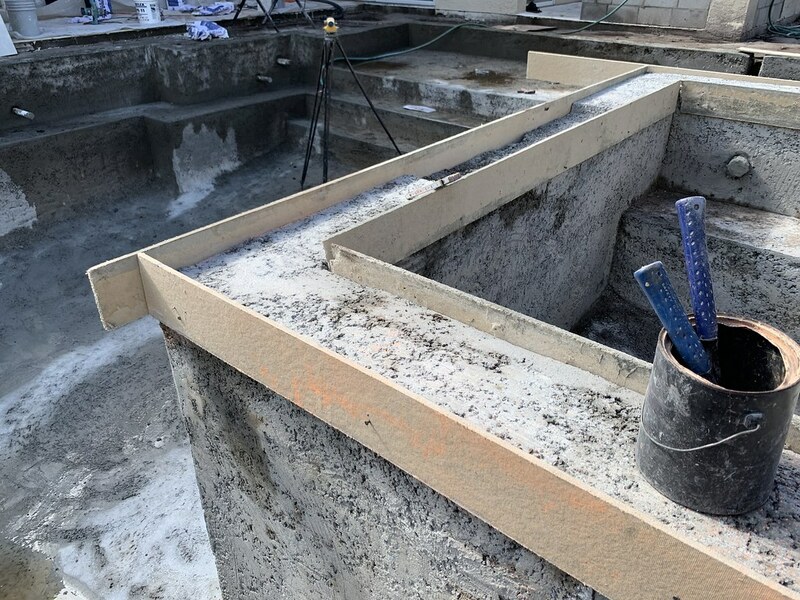 There was also a membrane put down over one of the sides where a single crack has developed to try and prevent the travertine from cracking as well. 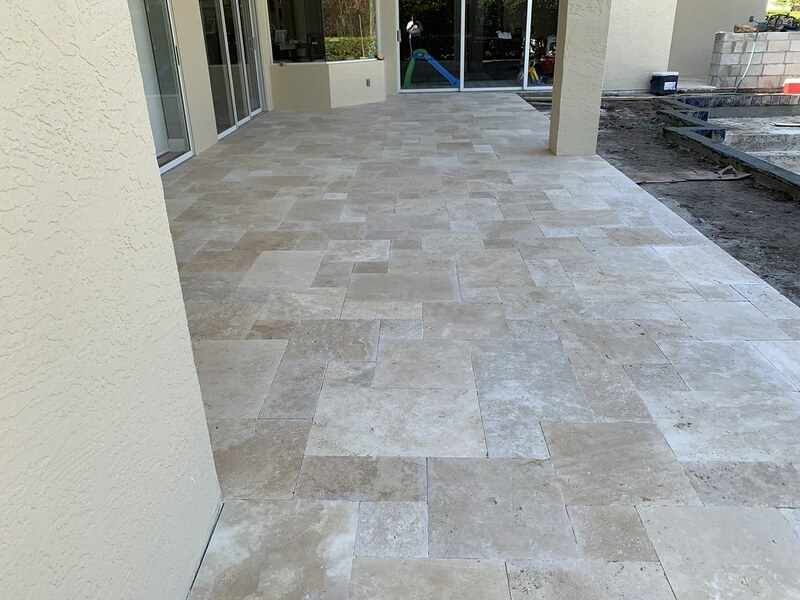 The tile is stunning and according to stone-mart, the tile and pavers are from the same lot and should blend together well. 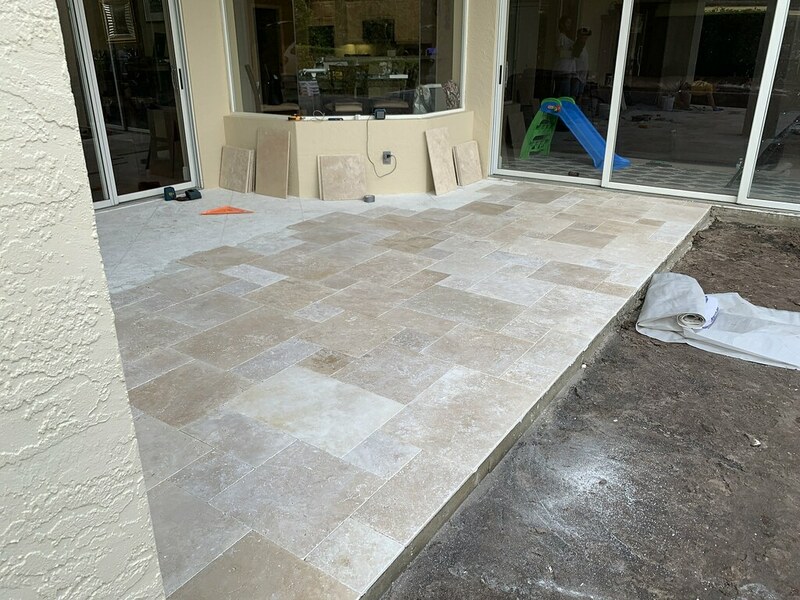 We chose not to grout the tile so that it will not look different from the paver deck and look as if it flows from one end to the other. 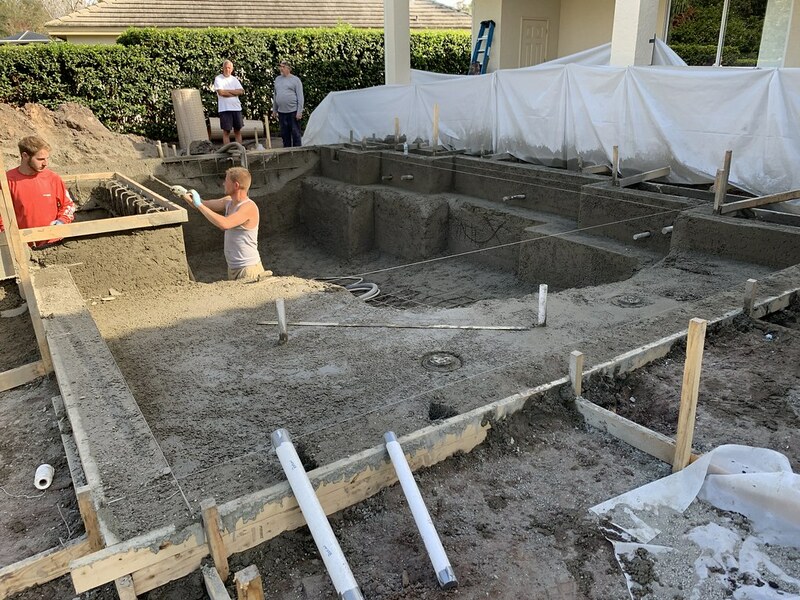 We are expecting a cold front to come through tonight, so they started the tile toward the pool so that they will be covered tomorrow should rain blow in under the patio. 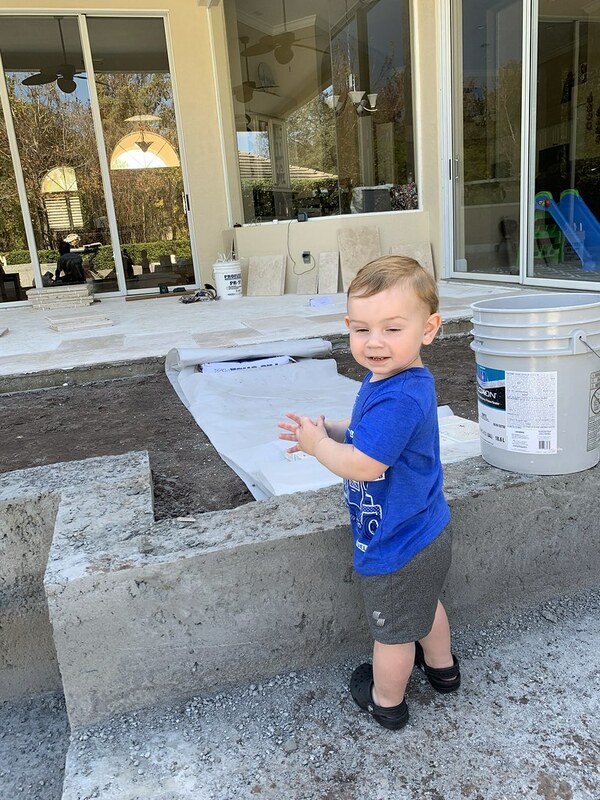 And as usual, boss man was outside making sure everything was copacetic and had to do his usual 50 laps up and down the pool steps. Bet the boss was happy when he got to go in HIS pool! SO CUTE! That love that pattern you have for the decking. So classic! Did you pick the same color as Bella? We picked a different tile than Bella. I will post pictures later. 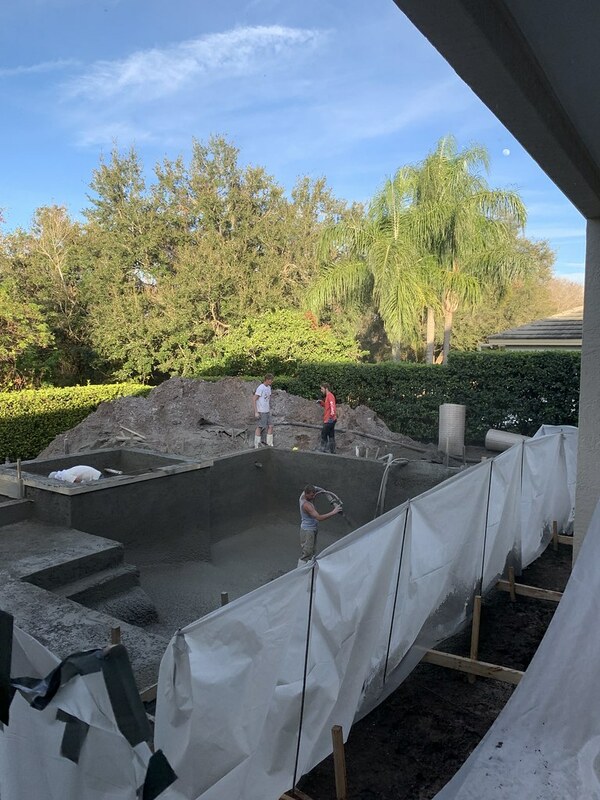 They are leveling the spa and pool beam outside right now. 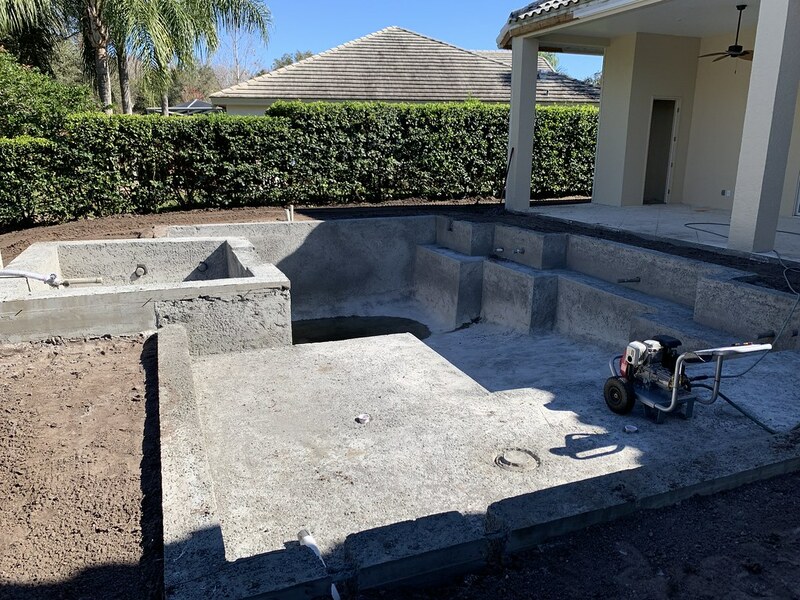 The skimmer is also set up and getting ready to be put in, so I’ll take some pictures of that set up. Apparently the way that it’s being done here is common practice locally. My parents pool skimmer was installed the same way 25 years ago and did not leak so clearly something works. The debate now is about the overflow in the back of the skimmer. Tile guy (and myself) want the hole punched out to run an overflow pipe out, but the plumber said that he advised against it. I just can’t remember what his reasoning was. That's a very common place for the overflow. I don't see what the issue would be. No auto fill, just the auto drain.... which will save me a ton of time in the summer when it rains every day! 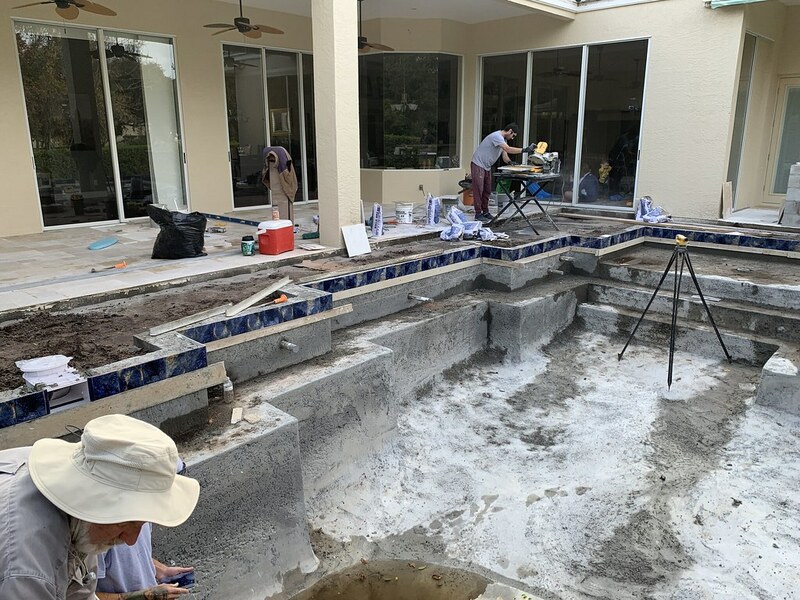 The waterline tile was done today in the pool. 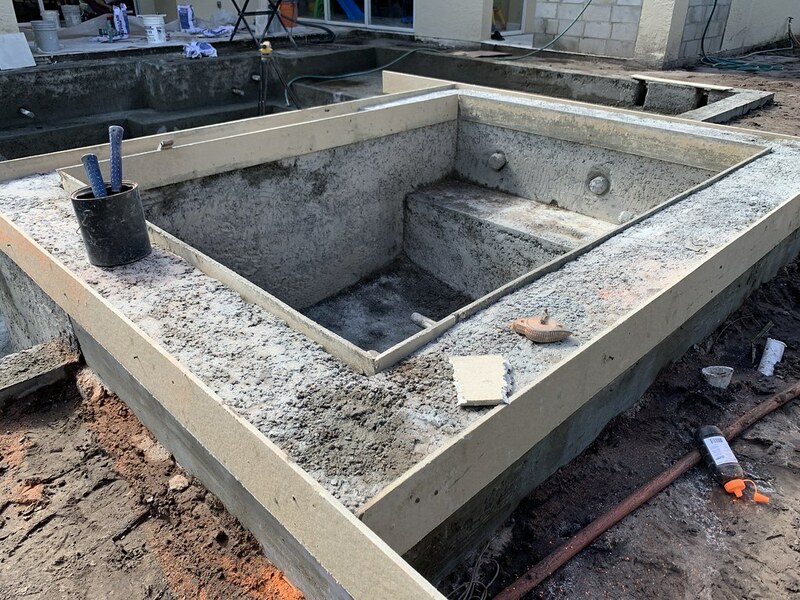 We changed it a bit again and are going to run the 6x6 tile around the front of the spa rather than just running the glass from the spa front down into the waterline. 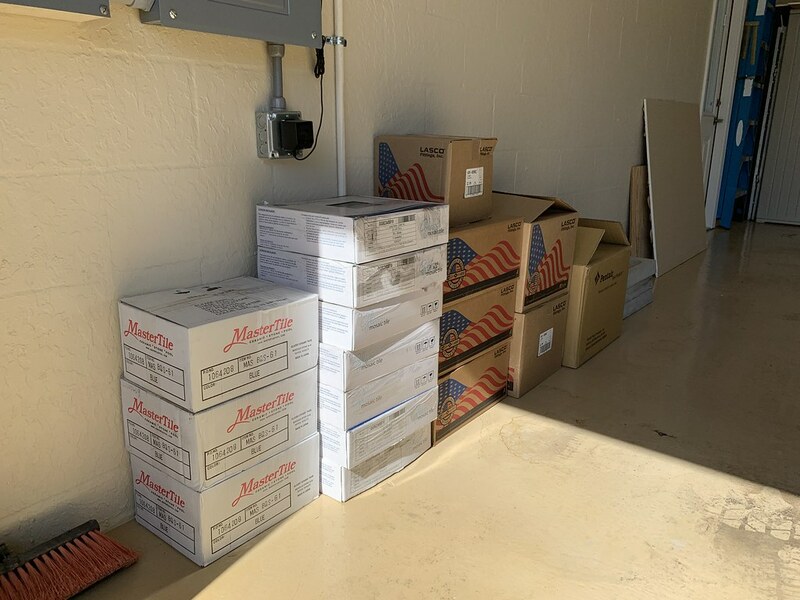 No big deal, but i have to go buy another box of tile since we only had a few extra pieces left over. 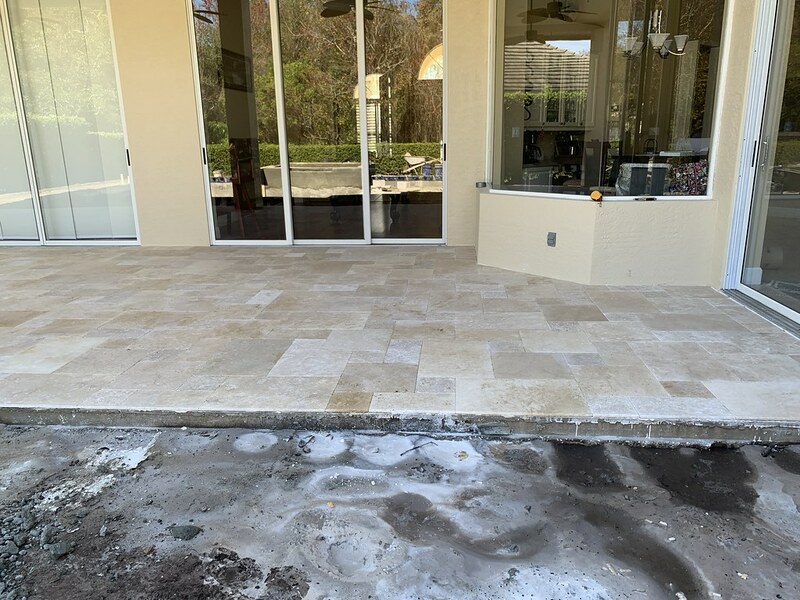 The travertine on the patio is done, they are just coming back in the morning to seal it. The skimmer is set. It was cemented in place. I will post pics tomorrow when I go back outside. The spa was off close to 3 inches in one of the corners, but it worked out when the beam was leveled. over the spa height!! SO glad they fixed that!! Looks like they did a good job with the waterline tile. Did you have a hand in picking out where the different pieces went? 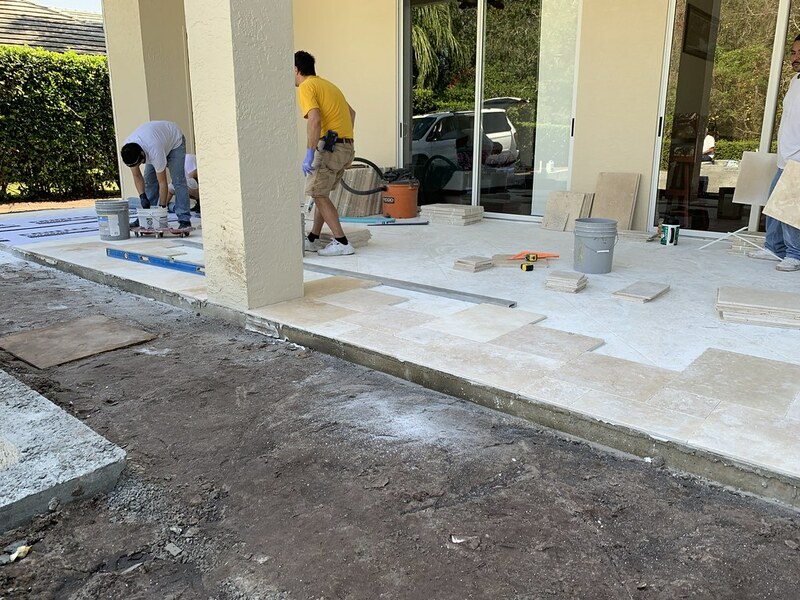 We had one build where they put all of the the light colors together and all of the dark ones together They ended up redoing it sigh.......Looks like your guys used good sense on that work! Looking forward to see the rest of the work. We tried to rotate the lighter and darker pieces. We pulled them all out of the box and laid them on the beam for him. There are a few that are almost identical that are every other tile in the deep end that my eye is drawn to, but i dont think anyone else will notice. 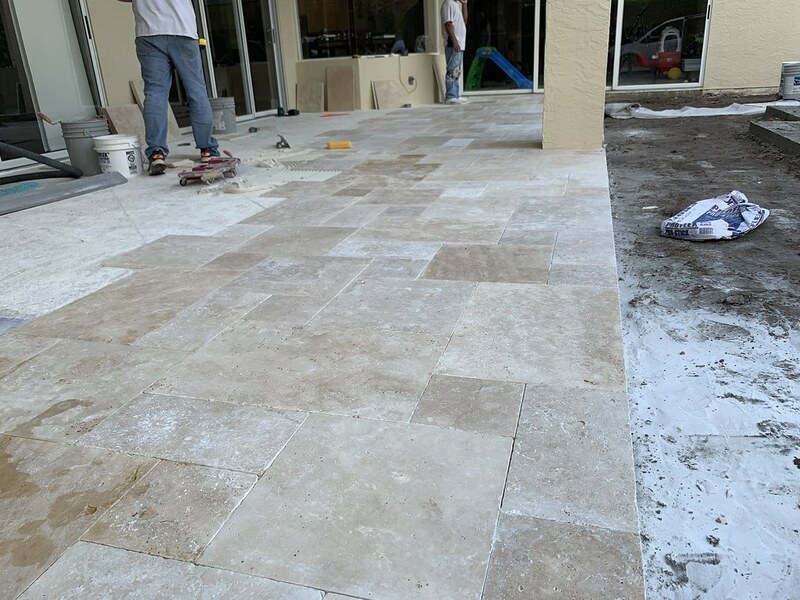 Travertine on the patios were completed today and sealed. We used a non-enhancing sealer so it will stay a lighter color as opposed to becoming darker with the enhancer. They floated the spa today which was not very plumb. 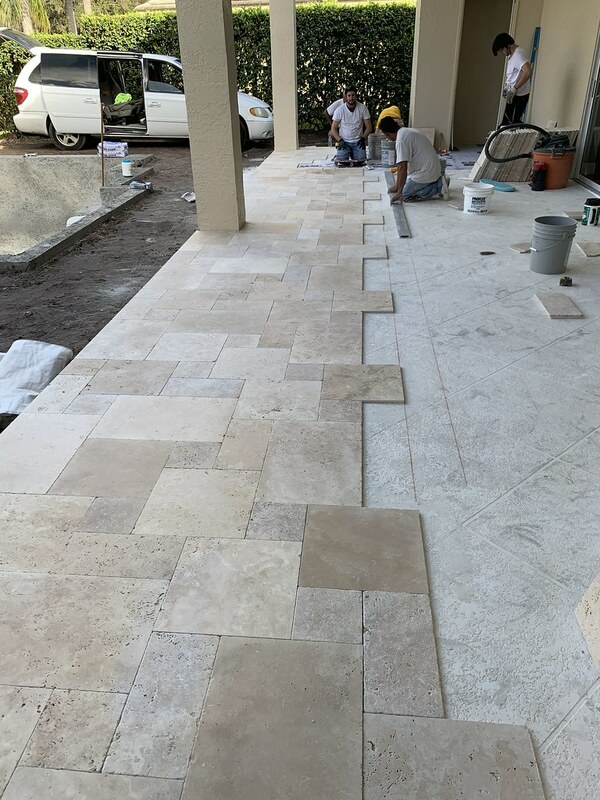 We ended up over ordering the double bullnose 12x24 travertine coping, and we had to float the walls of the spa out so much that the beam is now just past 12". We will have to go to stone-mart and re-order the double bullnose coping, so thats a few hundred dollar hit. Hopefully stone mart will either take it back or offer a credit on exchange since its a very common color. If not, good ole craigslist at a discounted rate should recoup some of the cost. Picked up another box of the waterline tile today......... $190 with tax. Ugh. Anyway, the glass tile is very transparent and im worried that it will look very light with a white thinset. Is there a chance that they can use a darker thinset or dye it a darker color to darken the blue up? Shot in the dark with that. I think it looks fine when i hold a piece up, but wife thinks it is too light.